Exit station and turn left. Continue along Massachusetts until it becomes Maryland Ave. NE. Turn Left at 13th Street NE. Turn Right on H Street NE. The studio will be on your right. Take 395 North towards Washington, DC. Take exit 6 on the right toward D Street NW, US Senate. Take exit 10 toward Massachusetts Avenue. Continue straight onto 2nd Street NW. Turn right onto H Street NE. The studio will be on your right. From Capital Beltway South. Take 95 North toward Baltimore. Take exit 2A-B to merge onto 295 N toward Washington National Harbor. Keep right on Anacostia Freeway N toward 395, Capitol Hill. Exit left onto Benning Road. Turn left onto Benning Road. The studio will be on your left. Neighborhood street parking available, 2-Hour time limit most days. Metered parking available on H Street in front of the Studio. Click here to download the Park Mobile App! Visit District Department of Transportation online for more information about parking restrictions and meters. The Union Station Metro Stop on the Red Line is the closest Metro station. Walking from the Metro takes between 20-30 minutes and is about 1.2 miles. Head east on Union Station Drive NE and turn right toward Columbus Circle NE. Turn left on Columbus Circle, continue following around until Columbus Circle becomes F Street Northeast. Turn left onto 4th Street Northeast and follow for about a quarter mile. Turn right onto H Street Northeast and follow until you arrive at our studio. 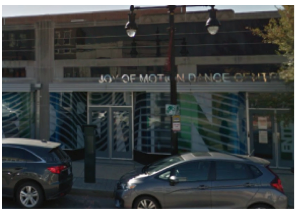 Joy of Motion’s H Street Studio is between 13th and 14th Streets on the right side of the street. See these directions on Google. The DC Streetcar departs from the Hopscotch Bridge every 15 minutes. To get there from Union Station, use the elevators or escalators to go up one level from the Amtrak waiting area and go north through the Union Station parking structure toward H Street. Disembark the Streetcar at 13th and H and walk to the Atlas. Runs along H Street from Lafayette Square (16th Street) to Minnesota Avenue and connects with Metrorail at Gallery Place/Chinatown Station. * NOTE: the street address for our Bethesda studio is on Wisconsin Avenue, but we suggest entering from Waverly Street. You will see “7315” over the entrance. Come up the stairs and into the lobby, take a left at the front desk, and head to the elevators. We are at the lower level (LL). Take exit 33 for MD-185/Connecticut Avenue toward Kensington/Chevy Chase and keep left at the fork, follow signs for Maryland 185 S. Turn left onto Connecticut Avenue. Turn right onto MD-410 W (signs for State Hwy 410). Turn left onto Wisconsin Avenue. Make a U-turn at Elm Street and turn right onto Waverly Street. The Waverly Street entrance to the Bethesda Crossing building will be on your right. Public metered parking available in the Montgomery County Waverly Garage $0.80 per hour, Mondays-Fridays from 7:00am-10:00pm. You are also able to pay with your mobile device (app download required). For more information please visit Montgomery County’s Department of Transportation online. Our Bethesda studio is conveniently located less than 0.1 mile from the Bethesda Metro station on the red line. Visit WMATA to access Metro trip planner for bus/rail. The Friendship Heights studio is located on Wisconsin Ave NW between Harrison St & Ingomar St very close to the Friendship Heights metro station on the Red Line. Take the Red Line to Friendship Heights. From the main Metro exit, head Southwest on Wisconsin Avenue (towards the District & Mazza Gallerie shops), follow for 0.3 mi to the studio. 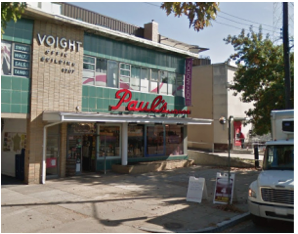 The Friendship Heights studio will be on the left, and is on the second floor of the building. Visit WMATA to access Metro trip planner. The 30N, 30S, 31, 33, and N2 lines all drop off at Wisconsin Ave & Harrison Street NW. Neighborhood street parking available, 2-Hour time limit most days. 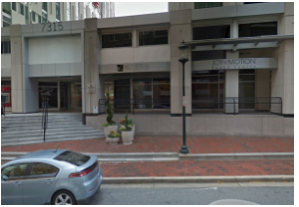 Metered parking available on Wisconsin Ave front of the studio outside of rush hour. Click here to download the Park Mobile App! Visit District Department of Transportation online for more information about parking restrictions and meters. There are also several paid parking lots run by Colonial Parking near the studio. Click here to see a list of paid lots.